People who smoke quickly become addicted to nicotine. About one-third of the 50 million Americans over age 18 who smoke will try to quit this year, but only 5 million will be successful. Quitting reduces the many risks associated with smoking. 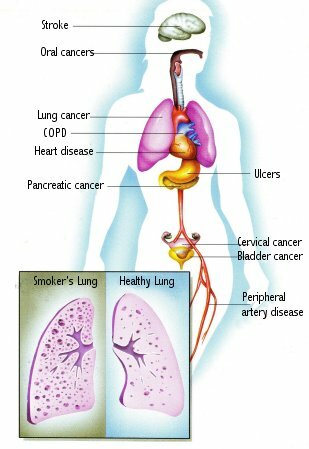 Many diseases associated with smoking are shown in the illustration. Smoking cessation support groups and programs are available to help get past the initial nicotine withdrawal (with gums and skin patches) and the psychological withdrawal which, in some cases, can be a life-long battle. Ten years after quitting, the risk for lung cancer drops to half of those who keep smoking. Smoking is clearly linked to the deaths of over 450,000 Americans and is the direct cause of most lung, head and neck cancer, as well as heart disease, stroke, decreased fertility, spontaneous abortions and low birthweight babies. But beyond the disease states smoking causes, smokers lose 5 to 8 years of their lifeor 5 1/2 minutes for each cigarette smoked. Addiction: Surprisingly, most people who smoke want to quit. Many people try each year but fail because the addiction to nicotine is so strong. Nicotine, the primary ingredient in tobacco, is a powerful drug that is absorbed very quickly when suspended in smoke and inhaled into the lungs. Within seconds, the drug reaches the brain, giving the smoker a “rush” and satisfying the craving for tobacco. Its effects are short-lived, however, which explains why a smoker’s craving for another cigarette returns after an hour or two. It is common for an ex-smoker to resume the habit even years after quitting. Cessation Programs: There are many methods of quitting smoking, but the most popular are smoking cessation programs, through which smokers learn about their smoking behavior and how to change it, either on their own or with the support of a group of smokers trying to quit. These behavioral modification programs are offered through non-profit groups such as the American Cancer Society, American Heart Association, American Lung Association and private institutions. Non-profit programs are inexpensive and effective. There are also commercial programs available like SmokEnders, which are usually more expensive but work well for some people. Private counseling with physicians or behavioral psychologists is a more individualized method of quitting. Some smokers find hypnosis helpful, but this method is questionable, because it is not uniformly reliable. Acupuncture is also used in smoking cessation programs, but it has not been proven to work for large groups of patients. It may be effective as a placebo in treating the behavioral addiction to smoking. Withdrawal: The physical withdrawal from nicotine begins within 24 hours and usually lasts no more than a few weeks, but the craving can last for years. Relapses are common in trigger situations in which smoking was part of a routine behavior pattern, such as eating, talking on the telephone, drinking coffee or alcohol. Symptoms of nicotine withdrawal are usually seen within the first 48 hours and commonly include irritability and restlessness, poor concentration, anxiety, headache, drowsiness, lightheadedness, insomnia and, of course, the craving for tobacco. These symptoms can be eliminated through the use of over-the-counter nicotine replacement products. These products do not eliminate the behavioral addiction to smoking, but they are designed for short-term use to eliminate the symptoms of physical withdrawal from nicotine. The products are designed to be used in conjunction with motivational materials that help the patient stop smoking. The products are in the form of gum or a skin patch that slowly releases nicotine into the skin. Quitting “cold-turkey” is more effective than weaning off tobacco or switching to lower tar/nicotine cigarettes, but motivation and willpower are very important. If you have any questions about smoking cessation programs, be sure to talk to your pharmacist.